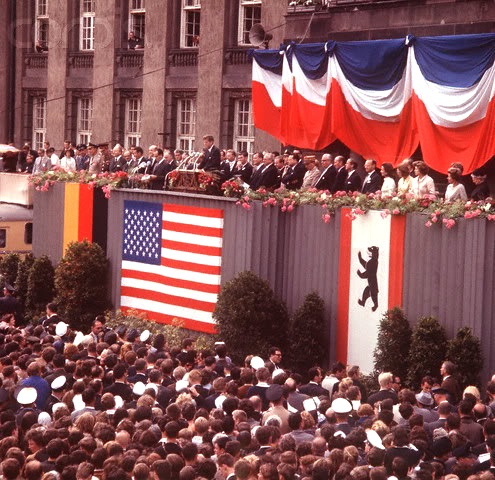 « I am proud to come to this city as the guest of your distinguished Mayor, who has symbolized throughout the world the fighting spirit of West Berlin. And I am proud to visit the Federal Republic with your distinguished Chancellor who for so many years has committed Germany to democracy and freedom and progress, and to come here in the company of my fellow American, General Clay, who has been in this city during its great moments of crisis and will come again if ever needed. There are many people in the world who really don’t understand, or say they don’t, what is the great issue between the free world and the Communist world. Let them come to Berlin. There are some who say that communism is the wave of the future. Let them come to Berlin. And there are some who say in Europe and elsewhere we can work with the Communists. Let them come to Berlin. And there are even a few who say that it is true that communism is an evil system, but it permits us to make economic progress. Lass’ sie nach Berlin kommen. Let them come to Berlin. What is true of this city is true of Germany–real, lasting peace in Europe can never be assured as long as one German out of four is denied the elementary right of free men, and that is to make a free choice. In 18 years of peace and good faith, this generation of Germans has earned the right to be free, including the right to unite their families and their nation in lasting peace, with good will to all people. You live in a defended island of freedom, but your life is part of the main. So let me ask you as I close, to lift your eyes beyond the dangers of today, to the hopes of tomorrow, beyond the freedom merely of this city of Berlin, or your country of Germany, to the advance of freedom everywhere, beyond the wall to the day of peace with justice, beyond yourselves and ourselves to all mankind.